Looking for a WordPress theme that is a bit different and suits your very individual personality? Blog images, colors, menus, and more can be customized directly from your WordPress administration panel using a simple visual interface. Changing from a light blue theme to a dark red theme or a classy silver theme is just a few button presses away. Make your blog into its own one of a kind – just like you. Enjoy! Updated Edit Skin interface so that it works with the Theme Customizer updates in WP 4.4. 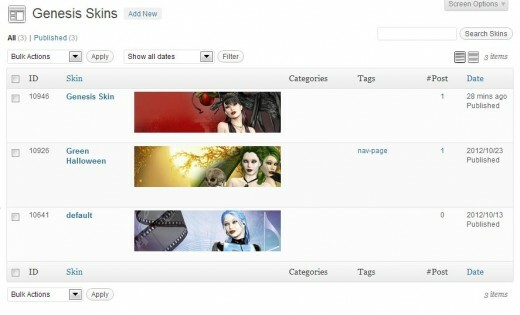 Genesis Skins uses the new WordPress theme customizer interface, as well as the new media manager interface. Therefore, it can only be used with WordPress 3.5 and above. We can create new skins or edit existing skins by going to the Genesis Skins menu tab on our WordPress Dashboard. A screenshot of the skin editing interface is shown below. Skin images – header, footer, body (repeats itself between the header and footer images), background, and widget. 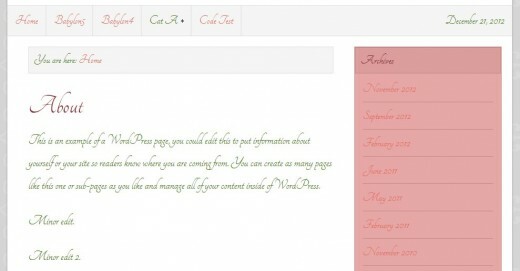 Skin colors – header text, link text, body text, blog color, widget color, and background color. This Color Scheme Designer can help with picking a blog color palette. Skin menus – each skin can be associated with different primary and secondary menus. Other skin settings – including blog border, header and footer heights, and more. If the Shiba Gallery plugin is installed, we can also associate our skins with the different gallery frames provided by the plugin. For example, the images and galleries on this page uses a simple white frame which is different from the gallery frame used in the front page of this blog. 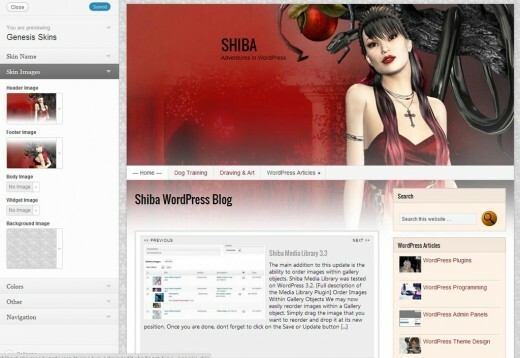 The skin design interface uses similar controls as the WordPress theme customizer. However, instead of saving customizations to a single theme design, we can now save our creations into a skin object, and create as many skin objects as we want. Once a skin is created, we can assign it to different posts, pages, tags, categories, and more in our WordPress blog. For example, this particular page uses a different skin than my blog frontpage. Once a skin is created, we can assign it to different posts, pages, tags, categories, and more in our WordPress blog. A full-width header widget area. A full-width footer widget area. A before post widget area. An after post widget area. Multi-column widget support is available through the Shiba Widgets plugin. Blog images, colors, menus, and more are customizable directly from our WordPress administration panel through a simple visual interface. Images can be loaded from our local computer or from our WordPress Media Library. Different skins can be assigned to categories, posts, and pages. This WordPress blog, for example, has different skins for many of the category groups, as well as some individual skins for some posts and pages. Skins can be exported and imported using the standard WordPress import/export tool. This allows us to easily move our skin designs from blog to blog similar to our WordPress posts. 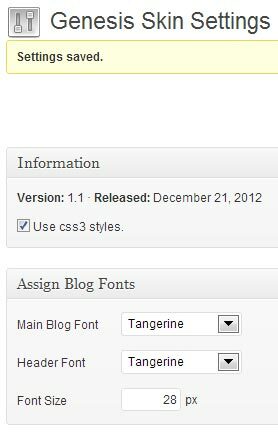 Change blog-wide body and header fonts through a simple drop-down interface in the Genesis Skins >> Settings page. Easily add your own Google Fonts by hooking into the genesis_skins_fonts filter. Genesis Skins is mobile responsive. We can add our own google fonts into the Genesis Skins theme by hooking into the genesis_skins_fonts filter. Below, is an example of how we added the Tangerine font. Easily assign body and header fonts from the Genesis Skins >> Settings page. Line 5 – The first name (e.g. Tangerine) has to be a valid font on Google Fonts. Only the first font will be loaded from Google. This will add Tangerine to the drop-down menu on the Genesis Skins >> Settings page. Then, we can easily select it and assign to our blog pages. 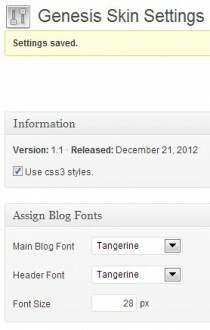 Using the Tangerine font on both the body and header text of our blog page. Fixed “Add New” button so that it directs to Theme Customizer. Updated theme customizer saving function so that multiple skins can be edited at the same time. Removed unnecessary controls from the Edit Skin interface. Fixed skin saving issues as well as header/footer image updates in the Edit Skin interface. These issues were introduced by changes to the Theme Customizer code in WordPress 4.1. Remove ID field from the Edit Skin screen. Tested on WordPress 4.0 and Genesis 2.1+. Enable header font sizes to be controlled separately. This enables us to use very different font styles (font families) for header and regular text, and still have them work well together. Made the article padding for mobile displays be consistent for both fill and non-fill (bordered page) skin types. Updated for Genesis Framework 2.0+. Uses HTML5 structured markup language. Added new menubar styling options as well as collapsible menubars for small devices. Added some styles to make standard Poll Daddy objects mobile responsive. Pages can be rendered with an open design (no borders) or with page borders. This can be assigned on a skin by skin basis. Integrated with Genesis 2.0 stylesheet. Updated for Genesis Framework 1.9.1. There was a big change in stylesheet from Genesis 1.8 to 1.9. Options are provided in Genesis Skins >> Skin Settings to set menu styles and button styles according to 1.8 or 1.9. 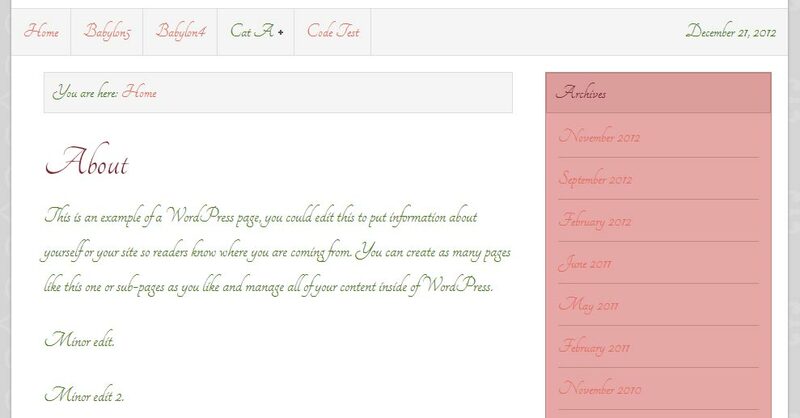 Edit Skin uses the new media manager interface for assigning header and footer images. Header text position is now set relative to the center of the browser. This allows the text to stay in a static position with respect to the background image. Theme Customizer object is now only loaded for theme customizer screens. This makes the theme cleaner and more efficient. Updated for 3.5 (added AJAX screen checks, fixed wpdb::prepare, updated media upload interface check). We can now change site body and header fonts through the Genesis Skins >> Settings page. Add your own google fonts by hooking into the genesis_skins_fonts filter. Create and manage skins for the Genesis framework. 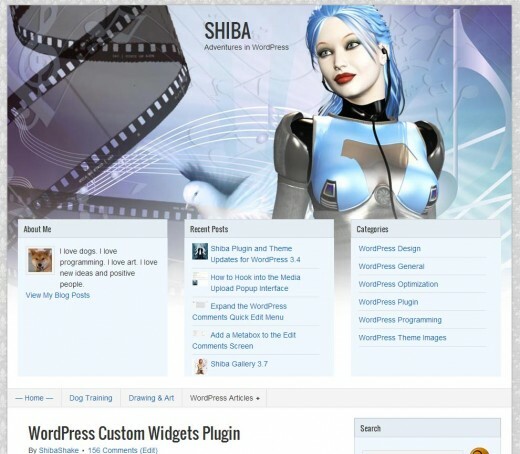 Customize skin images, colors, menus, and more using the new WordPress theme customizer. Assign different skins to posts, pages, categories, tags, and more. All these WordPress theme images are created for the Genesis Skins WordPress theme, but they can also be used with other themes (with proper attribution). Pick which theme images you want, and save them onto your computer. Then simply load them into a skin of your choice. Here are more detailed instructions on how to create and load images into Genesis Skins. I loaded the theme update for a few days and all worked fine. Today I got an Genesis Framework update. After loading this, the Genesis Skins theme lost the bottom image. I delete the image for the bottom of the theme and load ist again, but it didn’t help. I delete the update for Genesis Frameworks and use the old version again. Everything is fine. If you don’t get the same issue, maybe I make a mistake when I load the Genesis Skin before the update for Genesis Framework. Would be nice to here from you.